I have heard it said repeatedly (and in fact seen it on this forum ) that the doppelsoldner were valued particularly for the use of their Zweihanders against pikes, and that they would use these to "chop the heads off" the pikes. The problem I have with this is that the physics of it seem very unlikely. You have a very long pole which is going to have a lot of flex near the tip (as it is not secured) being severed with a relatively slow moving blade (not saying that a twohander is a slow weapon compared to other swords- any muscle powered weapon is slow in this context). Added to that, the only part of the pike which is "secured" is just held in someone's hand, obviously allowing a lot of give. Does anyone have any firsthand accounts of this actually happening, and/or has anyone been able to replicate it with reproductions? It does seem far more likely that the zweihanders could be used to push the pikes aside, but why would these twohanders be deemed so much more effective at this than, say, a halberd or glaive, or even a sword & shield? As You already mentioned, the flex of the pikes made it very hard to cut the head off. We tried this more than one time and it´s not practical. Bidenhander (or Zweihänder) are good for breaking in the enemies ranks, pushing the pikes away, the fighting is more a thing of short swords and halberds, coming from above. We think, the Bidenhander is more a weapon for bodyguards, the most used great weapon was the halberd, especially if You look at the younger examples with the playful details, more for bragging. I think a lot of the confusion stems from the fact that many people assume that doppelsoldner meant a landsknecht who wielded a two handed sword where actually it was simply one who received double pay to perform the more dangerous roles. While some landsknechts were equipped with two handed swords and qualified as doppelsolders, the majority faught in the fronts lines with pikes and halberds and even sometimes firearms. I don't know where or when the story of chopping off pike heads started but all the tests I have seen have shown that this would be an incredibly difficult feat to pull off. Disrupting or breaking up a pike line is likely a more realistic use but halberds are probably just as capable in this use and thus appeared to be the more popular choice for front line troops who had much less space to work with. My guess is that two handed swords were good weapons for fighting out of formation, such as when a line was broken/breaking down and this may have been why they were a popular choice for bodyguard units. Of course it bodyguards may have carried them simply for the prestige factor/image, similar to later period officers carrying sabres. As far as I remember, our ancestors praised the twohanders capability to hold many assilants at bay on its own. Somebody recommended them as guardians to the banners. The ability to cut pike heads brings up an interesting question: If the heads couldn't be cut then what purpose is served by langets? I've assumed that they exist to protect the shaft from weapons and not at reinforcement since wood axes don't need langets. But I'll admit that I've never seen specifics on the matter. This leads to the question of how: If the pikes point had been swept to the ground then it should be much easier to cut than while it's waving in the air. Of course if langets are standard then the cutting off of heads doesn't make as much sense. All told that means that the advice I've seen for multiple attack scenarios given in period manuals revolves around wide sweeping blows. And as such a zweihander might be well suited for after the ranks break up and small unit actions. Or perhaps they are more useful while "foraging" than while fighting. From personal experience, I've removed spearheads with a jian more than once. That was a one-handed jian too, and therefore nowhere as powerful in a cut as a two-hander. Grounding the head and stomping the shaft breaks a spear or disarms a spearman as well. I can see a two-hander being very effective in the pike-breaking role. Much like Daneish axes, perhaps as much fear as function. I always figured the langets on a pike head were to reinforce it against typical use -- anti-moving body. How thick is a pike, anyways? I've never seen one in person. I never gave much credence to the "cut heads off pike" bit; I don't even see how you assail a pike formation with either the halberd or the zwei anyways -- if I misdirect one or two, there's dozens more with my organ's names on it. I don't even see how you assail a pike formation with either the halberd or the zwei anyways -- if I misdirect one or two, there's dozens more with my organ's names on it. I think the trick to it is that it's not just you. It's you plus, hopefully, at least as many pikemen as they have. some of whom will be protecting you from the dozens of enemy pikes you refer to, and attacking into any gaps you may have created. Its not the pike in front of you that kills you. It the one from 3 people over. I've seen many examples of landsknecht two-handers in period art and some pieces showing them right in the front line just as being argued against. However, the swords in I have seen are not the uber large and lugged two-handers as found in the later 16th century, the ones used in battle appear more like the late 15th century equivalents, which were generally shorter and in my opinion may have been better suited to closer in fighting. to back this there is a pdf file available that shows LOTS of period art about landsknecht, which I unfortunately no longer have the link to but perhaps someone may chime in who may know it. I would also recommend looking into images from "Maximilions Triumpfzug" as illustrated by Albrecht Durer, which should also be in the pdf (mind you it's in German but still lots of pics for those who don't speak Deutsch). I also have a pic of whose origin I no longer remember either but it clearly depicts two armoured swordsmen opposing an enemy pike block directly backed by the press of fellow landsknecht, armed with pikes and interestingly just as heavily armoured. I also have a nice and simple example of a "battlefield two-hander" , and its only around 57'' long, as opposed to the later ones which measured 60'' or even much more (see attachment below). Its obviously more relevant for duelling than massed combat, but doesn't Fiore give several techniques for a man in harness to break his opponent's spear after its struck his armour but failed to penetrate? I imagine langets would help against moves like that. It seems like looking through descriptions of early modern battles might be helpful to answer Andrew's question. Greetings everyone. Decided to share my research on the subject. First of all, it is definitely possible to cut an unprotected pole even with typical falchion, and it is trivial with much more heavy zweihander/bidenhander/doppelhander. It's been tested up to firm conclusion. Second, it is virtually impossible to cut a pole protected with langets and false langets from all four sides. But it is perfectly possible to move one or even several pikes away for a few seconds. Pikes are very unwieldy weapons, prone to inertia, thus it takes some time to return them back to battle position. And no one have that much time. Third, two-handed sword in general may seem to be unsuitable to be used in close-quarters, and that is true. But we are speaking about germanic type zweihander with noticeable ricasso and false guard, two things that make halfsword techniques very viable. Zweihander can be easily converted to kind of shorter „polearm“ by wielding it at ricasso, very viable for tight quarters. Fourth, no matter what third says, on battlefield zweihanders seemed to be weapons mostly for guardians and flanking „special force“ soldiers. True, this weapon shines in hands of dedicated solo warrior against either one opponent or small crowd. Front line soldiers who supported pikemen usually wielded some sort of polearm like halberd. Actually good cutting polearm provides most of the benefits of two-handed sword. Not all, but most. And it is way cheaper. In conclusion: pushing, not breaking. Breaking is atypical, probably only for damaged and/or cheap unprotected poles. And halberds did the same job. My personal favourite (from style point) is Spanish way, employing sword-and-shield rodeleros, who pushed enemy pikes by their shields and swords, rushing their way into close quarters and quickly destroying those who stand in the way. I've read somewhere here in the forum that exactly that did not happen. The Rodeleros were slaughtered whenever they tried to break an intact formation of pikemen. They were mostly used as light infantry against pikes on the move in the end and probably against formations that were broken up after they had moved over the spanish field fortifications too. I believe the rodeleros did enjoy some success against pikeman most notably against the French employed landsknechts at the battle of Ravenn. The rodeleros apparently used the tactic of ducking/rolling under the sea of pikes to engage in close quarter combat and in this battle at least they were able to inflict considerable casualties this way. It does seem though in more cases than not the pikeman mercenaries tended to roll over the Spanish rodeleros. There seems to be a goodly amount of info there, but I don't read German. On each side of the men with pikes, halberds and other melee weapons stod 23 ranks of men with firearms, each rank was 5 files wide. The first 4 ranks were made up of "doppel-schützen" i.e men armed with heavier firearms such as the musket or doppelhaken. 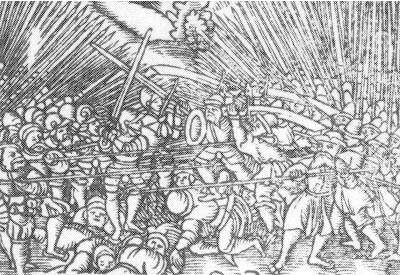 Each 400 man "fähnlein" of Landsknechts were to have 100 "fully harnessed" pikemen armed with pistols(!) (50 of these were to be doppelsöldner), 50 men with two-handed swords or other good polearms such as halberds also armed with pistols ("Good and experienced men to guard the standard") 50 unarmoured pikemen and 200 shot with firearm, good 'rapiers'(!) and helmets. The only doppelsöldner were the 50 picked pikemen. According to Junghans von Olnitz a "Fähnlein" of 500 men should have 200 arquebusiers, 200 pikemen, 45 halberdiers, 45 men with boarspears and 10 men with "schlachtschwert". Wintzenberger have a Fähnlein of 300 men: 82 doppelsöldner with harness and pikes, 14 doppelsöldner with harness and "schlachtschwert", 18 halberdiers, 42 musketeers and 144 arquebusiers. At Ravenna the Landsknechts were disordered by moving across the Spanish field works as well as by the Spanish fire, it is only here that we find an account of the rodeleros getting under the pikes usign that particlualr technique. Had they been able to do so in the open field against an ordered formation of pikemen it would have been noted by the contemporary writers. Nor would there had been any need for the Spanish to adopt their standard tactics of fighting from behind fortifications. (Cerignola, Ravenna, Bicocca). Interesting about the rondeleros too- that was actually going to be a follow-up question of mine (especially interesting to me as I am currently learning sword-and-target techniques). The important thing to remember I guess is that the pike formation would not have been such a major component of armies for so long if there was some comparatively "easy" way to defeat it. yes M. that's the file, very nice isn't it? It's a shame they don't have an English translation but it lets me test my German. That is Interesting Daniel, where by chance have you gotten this info? It explains the armoured pike men in my pic and also the numbers for a typical Feahnlein and why there were only been 2 swordsmen up front.